Unique, Modular Digital PID Control SMT Rework/Repair System with a Pre-heater. This new generation system offers precise and accurate monitoring of process temperatures at a working point on a PCB. Also, allows pre-setting of exact temperature of air stream at the end of Hot Air Tool, Hot Air Pencil Nozzles and at a tip of Soldering Iron. Board Holder with X and Y micrometer adjustments and precision rotation stage allows fine alignment of a component with the corresponding land pattern on the board. 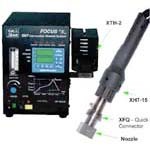 FOCUS Series is a family of Convection Rework Systems for every application. The family includes Low Cost, simple models for basic tasks and Sophisticated, Programmable and Intelligent models for more complex rework. X-1000 Series - The Most Powerful and Cost Efficient middle and small size Area Pre-heaters on the Market Today. The must, for safe Rework/Repair of the multi-layer and large boards to do it safely and to do it right. The investment which Nobody will regret. X-1003 - Large Area Preheater for Motherboards and larger multilayer boards.